Have a question on Tiago? Tiago is available in 8 different colors - Titanium Grey, Pearl White, Platinum Silver, Berry Red, Sunburst Orange, Pearlescent White, Espresso Brown and Striker Blue. Watch latest video reviews of Tata Tiago to know about its interiors, exteriors, performance, mileage and more. Tata has been offering hatchbacks in its portfolio for a very long time ranging from Nano, Indica, and Bolt but the absence of a solid and contemporary mid-sized hatch was missing. In the recent times, mid-sized hatchbacks have been garnering attention as they make up for a perfect family car. So, Tata came up with the all-new Tiago back in the year 2016 and so far it’s the company’s best bet. Tata’s Tiago is small but agile, and of course, it does tick all the boxes that make the car so competitive in the segment. 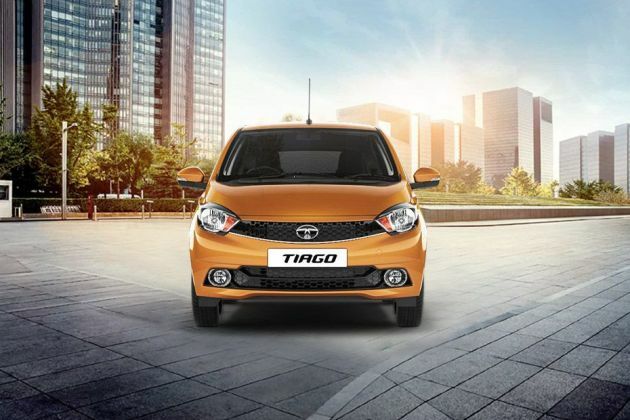 With the Tiago, Tata offers a well-engineered, modern day package to the Indian customers in a compact vehicle. The car does not look anything like we have seen before; it looks fresh and appealing in terms of features and comes with refined engine options. On the outside, Tata Motors has designed the vehicle with utmost diligence keeping in mind that it does not retain anything from the previous models. Tiago is a right mix of boldness and simplicity and that where its Impact design language comes into the picture. True to its name, its new theme really works for the Tiago. The front façade gets black honeycomb radiator grille outlined by chrome. The headlamps are large and swept back while lower bumper gets round fog lamps and air intakes. Character lines on the side make it look more attractive and act as shadow lines. The rear profile looks chic and houses wraparound but small tail light cluster and roof spoiler. Colours on offer are Sunburst orange, Berry Red, Platinum Silver, Expresso Brown, Striker Blue, Pearlescent White. Coming to its interiors, Tata Tiago has clean and contemporary design among all the other Tata hatchbacks. The main highlight of the cabin is the center console separated in two parts the upper portion features air conditioning vents and infotainment unit while the lower one getting temperature dials. In terms of space, hatchback scores well as it offers ample amount of space for the passengers while the boot space is 242L which is quite large and can be increased by folding the rear seats. Other features included in the Tiago are height adjustable driver’s seat, keyless entry, steering adjustment, EPAS system, and heater. The car comes with an 8-speaker sound system by Harman which is one of the main highlights inside. Colour co-ordinated cabin in the top-spec variants looks quite wonderful. Under the hood, it houses the newly developed engines. The petrol variants are powered by the 1.2L Revotron unit made from aluminum. The engine is capable of generating the power output of 85PS and yields the peak torque of 114Nm. On the other hand, its 1.05L diesel oil burner can produce 70PS and belts the max torque of 140Nm. Petrol comes with the optional five-speed AMT as well. Both the engines come with drive modes including City and Eco. As expected, Tata Tiago gets a bunch of safety features without compromising customer’s safety. The features include dual airbags, anti-lock braking system with electronic brakeforce distribution, corner stability, engine immobilizer, central locking, child safety lock, turn indicators on ORVMs and rear wiper. Tata Tiago is offered in five variants such as XB, XE, XM, XT, and XZ. In terms of pricing, Tata Tiago bridges the gap between Nano and Bolt with the base petrol model XB priced at Rs. 3.41 lakh while the diesel variant is available at the price tag of Rs. 4.21 lakh. Its top range model XZ is priced at Rs. 5.24 lakh for petrol and diesel trim is priced at Rs. 6.06 lakh which is also the top-selling model for the Tiago. The company has totally nailed the pricing, giving Tiago an edge over the rivals. With all these attributes, Tata Tiago goes up against the likes of Maruti Suzuki Celerio and Hyundai Grand i10 in the segment. Tata has certainly put a lot of effort on quality and it shows in the exterior design as well. Tiago is a solid build construction as against most of its insubstantial competitors. The proportions of the car are well on point. At the front, the car features hexagonal grille finished in gloss black and chrome outlining. The pulled back headlights blend nicely with the grille. The side profile gives a nice sporty stance with 14-inchers fitting the wheels quite well, while the bold waistline goes in line with the contemporary cars. At the rear, the car looks unique with spread-out taillights, a gracefully carved out tailgate and black spoiler which gives a sporty touch to the vehicle. Overall, Tata has put a lot of effort in design and leaves nothing to remind us of old Indica. The indigenously made engines are tuned to return maximum fuel efficiency at minimum fuel consumption. And the figures are impressive with the petrol and diesel engine delivering ARAI certified mileage of 23.84 kmpl and 27.28 kmpl respectively. The suspension setup in the car does its work silently without any complaints. The car is equipped with independent suspension up front and semi-independent at the rear which takes the passengers on bad roads and highways with utmost confidence. The steering wheel of the car is also light which translates into peppy and agile driving experience. Tata’s cars are known for their absorbent ride quality and Tiago is no exception. The hatch glides over bad roads and smartly dismisses small potholes with a little thud without unsettling car’s composure. Not only the car is brand new inside and out, but also the debut vehicle in which Tata’s new petrol engines have been introduced. The petrol engine is the 3-cylinder 1.2L Revotron motor that pumps out 85PS and peak torque of 114Nm. On the other hand, the 3-cylinder 1.05L Revotorq turbo diesel mill is capable of producing 70PS and 140Nm of max torque. Both the engines are mated to 5-speed manual transmission with the 5-speed automated manual transmission (AMT) being offered in the petrol engines. Tata has played smart here as well. The brakes are sourced from Bosch with 9th generation ABS and EBD. The braking power is progressive after a little rev. Further, the safety kit includes dual front airbags, corner stability control, central locking, seat-belt pre-tensioners, speed sensing auto door lock, engine immobilizer and rear parking sensors. What is the price of Tata Tiago? On road prices of Tata Tiago in New Delhi starts from ₹ 4.69 Lakh for base variant 1.05 Revotorq XE, while the top spec variant 1.2 Revotron XT Option costs at ₹ 4.72 Lakh. What are the colors options available in Tata Tiago?